Where do you see yourself in 10 years? I was asked this question for the first time during the interview for my first job. I agree with you; it’s an annoying interview question. I don’t recall my answer (I got the job in the end, so it was probably something acceptable). However, I remember thinking that I had no idea where I saw myself the following year, let alone in 10 years. You probably feel similar. This is perfectly understandable. It will be useful though to start picturing yourself in the future. c) setting up your own company in your hometown. Go back to the things that motivate you. Paint the picture with these in mind. 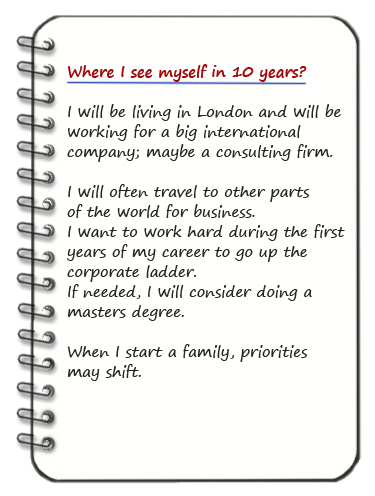 Write down how you envisage yourself in the future. There is no right or wrong answer. It is up to you to decide what and where you want to be. It will help you a lot to have a long-term goal. When you have a specific goal in mind, you filter all the information you receive in a way that enables you to make this happen. Do you remember the last time you wanted to buy, for example, a specific mobile phone. Suddenly, you start noticing everybody else’s mobile phone. You can spot who has one similar to the one you want from miles away. The same thing happens when you have a specific goal in mind. You filter all the information you receive (and you are bombarded by information every second) in such a way that you can identify all the opportunities that will help you achieve it. Life, of course, can have unexpected turns. It is important though to have a long-term goal so you know where you are heading even if you have to change it along the way. This entry was posted in b4iapply to college, b4iapply to uni, Before I apply, Career Advice and tagged career, interview, long-term goal, thing long-term, think big picture. Bookmark the permalink. 2 Responses to Where do you see yourself in 10 years?